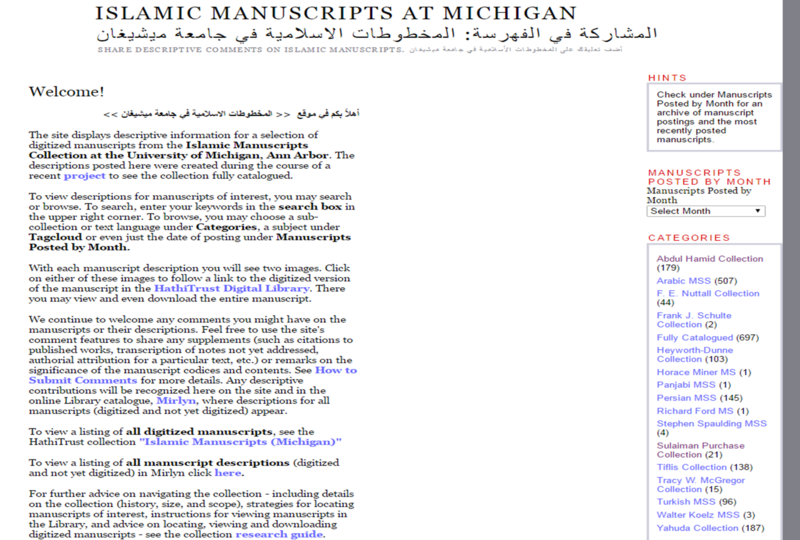 Looking for "Islamic Manuscripts at Michigan" ? Looking for Islamic Manuscripts at Michigan? Browse our catalogue! The Islamic Manuscripts at Michigan project site which invited commentary on a selection of manuscript descriptions has now been archived. You can find descriptions for all manuscripts from the collection, digitized and not digitized, in our library's online catalogue. Browse the entire collection, or search on terms of interest. Just choose Location: Special Collections and Collection: Islamic Manuscripts from the drop-down menus under Narrow Search To on the Catalog Advanced Search page. 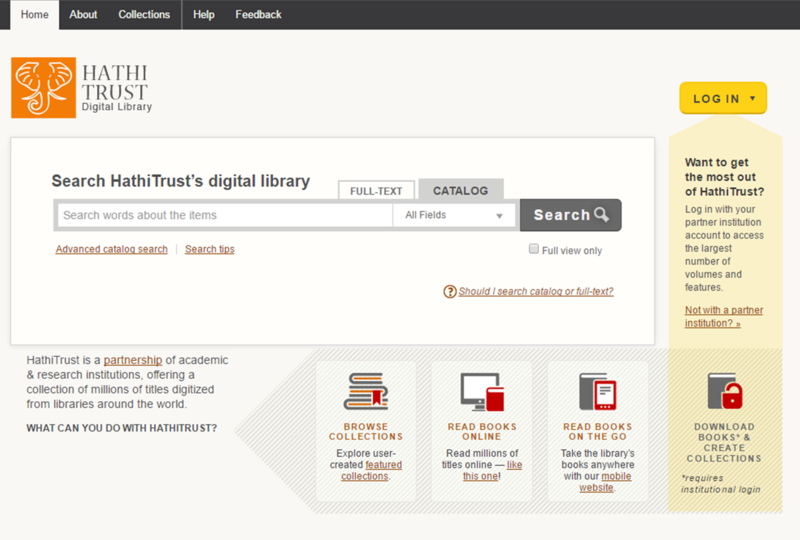 Look for the Available Online or Full text links in your search results to view the digitized manuscripts in the HathiTrust Digital Library. Browse this guide for more search advice, or contact the curator! All manuscripts of the Islamic Manuscripts Collection are described in the Library's catalogue, available via the Library Catalog Search or Mirlyn Classic interfaces. In Mirlyn Classic, you will find the entire manuscript description automatically displayed on a single page. This is helpful for easily navigating to different sections of the description using the search function in your browser (for example: ctrl + f). 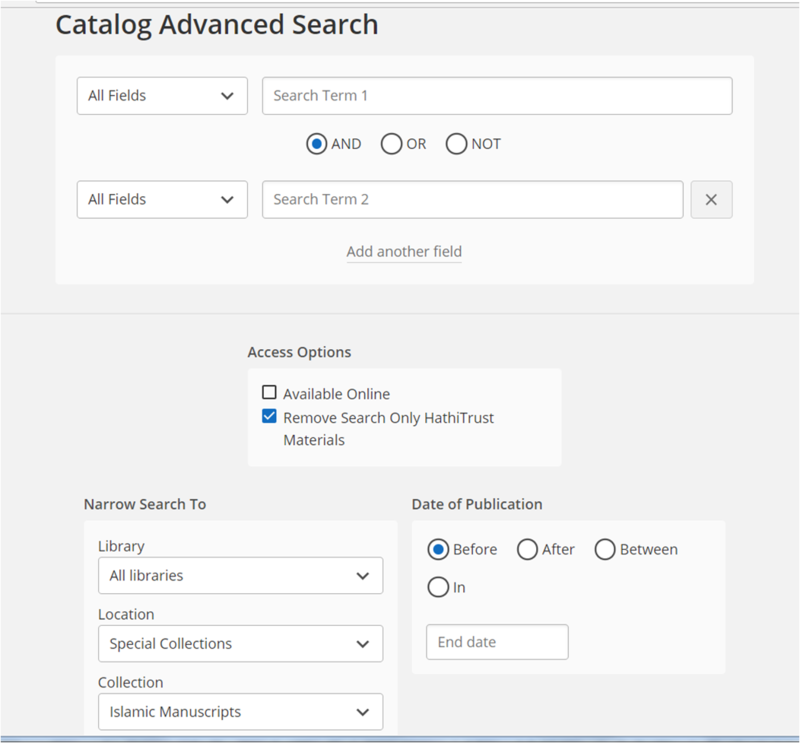 In either interface, you may use Advanced Search to search only manuscripts from the collection. Choose Special Collections under the Location drop down menu and then Islamic Manuscripts under the Collection drop down menu. You may also limit by language and search specifically by subject, title, author, etc. Use AND or OR to refine or expand your search. In Mirlyn Classic, use ? for truncation (for example: lacquer? will return all descriptions with lacquer, lacquerwork, lacquered, etc.). To browse all manuscripts by shelfmark / call number, click on Browse in Mirlyn Classic. Enter "isl ms" in the search box, select "Call number begins with..." from the drop down menu, and click Search. "manuscripts arabic michigan ann arbor"
"manuscripts persian michigan ann arbor"
"manuscripts chagatai michigan ann arbor"
"manuscripts panjabi michigan ann arbor"
"manuscripts maranao michigan ann arbor"
In Library Catalog Search you may also use the filters to refine your results by language, subject, etc. Keep in mind that some codices contain texts in multiple languages and so will show up in several different language searches. Manuscripts which have been digitized appear in the catalogue of the HathiTrust Digital Library, which you may search by keyword, author, title, and subject. For more manageable results, use Advanced Catalog Search, which will allow you to limit your search by format ("Manuscript"), language, etc. Keep in mind that only digitized manuscripts will appear in your results. For more information see How do I find digitized manuscripts? To the extent possible, any details transcribed from the manuscript are provided in the original script, mainly Arabic script (modified or not according to language). Most transcriptions of titles, incipits, explicits, etc. in Persian incorporate the proper characters ک and ی from the Persian keyboard rather than ك and ى from the Arabic keyboard. Transcriptions in Ottoman utilize the Arabic keyboard. Keep in mind that you may need to attempt your searches using both the Arabic and Persian keyboards. Transliteration / Romanization follows the scheme outlined by the Library of Congress in their Romanization Tables for Arabic, Persian and Ottoman Turkish, respectively. Ottoman Turkish presents a special case in that the principal of conversion is followed, i.e. romanized names and titles are converted to modern Turkish orthography. To locate a manuscript by its shelfmark (or call number), simply enter a keyword search with the shelfmark in quotes (e.g. "Isl. Ms. 570"). Use keyword or field searches to search by author, title or subject. For manuscripts with a colophon, try "colophon"
For manuscripts composed chiefly of quaternions, try "quaternions"
For manuscripts with marks designating the middle of a gathering, try "middle of the quire marks" or "mid quire marks"
For manuscripts transcribed in naskh script (nesih / النسخ / نسخى ), try "naskh"
For manuscripts with marginal glosses in decorative shapes, try "glosses" AND "shapes"
For manuscripts from waqf collections, try "waqf statement" or "waqf seal" or simply "وقف" or "waqf"
For manuscripts with transmission notices or certificates, try "ijaza?" or "transmission" or "audition"
For manuscripts with decorative papers, try "block-printed," "marbled," "silhouette," "gold-flecked," "dyed," or "tinted"
For manuscripts with endbands, try "endbands," "primaries" (i.e. primary sewing), "chevron"
For manuscripts with lacquerwork covers, try "lacquer?" For manuscripts with tooled covers, especially tooled central ornaments or panels, try "tooled" or "Weisweiler"
For manuscripts with sewing on four stations, try "four stations" AND "sew?" For manuscripts with some evidence of repair, try "repair?" For manuscripts with named copyist, try "copied by" or Author word(s) = "scribe"
Keep in mind that at this stage not all of the manuscripts have been catalogued to the same level of detail, so some manuscripts from the Abdul Hamid Collection and most of the McGregor Collection manuscripts will be excluded from a search addressing codicological features, transcriptions in Arabic script, or manuscript notes. Use Arabic script (modified for Persian) or Romanized / converted forms to search for names (e.g. الارزنجاني , al-Arzanjānī , Erzincani, Erzincanlı) and titles. Arabic script can also be used to search for transcriptions of the opening (incipit) and close (explicit) of a text, or of keywords, names or titles appearing in colophons and manuscript notes. Feel free to contact the curator with more specific queries and detailed research assistance. Déroche, François, et al. Islamic Codicology: An Introduction to the Study of Manuscripts in Arabic Script. London: Al-Furqān Islamic Heritage Foundation, 2006. Miller, Julia. Books Will Speak Plain: A Handbook for Identifying and Describing Historical Bindings. Ann Arbor, MI: The Legacy Press, 2010. Roberts, Matt and Don Etherington. Bookbinding and the Conservation of Books: A Dictionary of Descriptive Terminology. Washington : Library of Congress : 1982.
shelfmark, main title (with source), main author, other title(s) (with sources), place/date of production, physical dimensions, summary, subjects, language(s), format, incipit, explicit, colophon, dedication, contents, collation, layout, script, decoration, support, binding, accompanying materials, former shelfmarks, origin, ownership and history, included works (with authors), scribe(s), former owner(s), collator(s), patron(s), calligrapher(s), references, collection (i.e. sub-collection), and details of acquisition (displayed in MARC view). other title(s) (with sources): Refers to the various titles that might appear both within a manuscript and in standard reference works. Varying titles within the manuscript could be found on the endpapers, on the 'title page', in the preface, in the colophon, in quire signatures, on the spine, on the tail edge of the textblock, etc. incipit: Refers to the opening words of the text, the choice of which may allude to the subject matter of the composition, and in Islamic manuscripts most often beginning with the بسملة, followed by the حمدلة or تسبيح. In this scheme, refers to a transcription of the words following the بسملة. explicit: Refers to the final words of the composition proper. In this scheme, refers to a transcription of these final words just before the opening of a colophon. Also known as desinit. colophon: Refers to the final words at the end of the transcribed text - occasionally set off in form, size, script or even language from the main text - that address the circumstances of composition or production of the copy. A manuscript may have no colophon or multiple colophons (e.g., one for each volume in a multi-volume work or each corresponding to one of several works appearing in a single codex). In this scheme, if a colophon is present a transcription will be provided along with a statement identifying it as authorial or scribal and its form / shape. dedication: Refers to a statement in the manuscript regarding for whom the text was composed, particularly if it was commissioned by and written for a patron. In this scheme, a dedication note will address person to whom the text is dedicated and the nature of the statement. collation: Refers here to the establishment of the correct sequence of quires in the textblock by means of catchwords, quire signatures, and foliation. In this scheme, expressed in a statement of collation with a description of the foliation, the quire signatures, and any catchwords. layout: Refers to the arrangement of various elements on the page (mise-en-page), as well as number of lines per page and the presence of rulings and/or prickings. support: Refers to the writing material (namely papyrus, parchment or paper), its nature and state of preservation. In the case of paper, this scheme addresses whether European or non (Arab, Persian, Indian, etc. ), laid or wove with orientation and measurement of the laid and chain lines, description of any watermarks, and characterization of the surface and furnish. Obviously much of this cannot be assessed via the digitized manuscript but must be supplied through an examination of the physical codex. binding: Addresses not only the cover and any secondary coverings or enclosures in terms of materials, ornament and other physical features but also structure, attachment to the text block (or lack thereof), sewing, endbands, condition, and evidence of repair. Emergent typologies are also referenced (e.g. type II >> cover includes a flap, type III >> cover does not include a flap, two-piece binding, framed binding, wrapper binding, etc.). See Déroche et al. Islamic Codicology; Max Weisweiler, Der Islamische Bucheinband des Mittelalters. Wiesbaden: Otto Harrassowitz, 1962; Karin Scheper, "Refining the Classification of Islamic Manuscript Structures," In New Approaches to Book and Paper Conservation-Restoration, Ed. Patricia Engel, et al. (Horn/Wien: Verlag Berger, 2011): 357-383; Jake Benson, “Satisfying an Appetite for Books: Innovation, Production, and Modernization in Later Islamic Bookbinding,” In Persian Language, Literature, and Culture: New Leaves, Fresh Looks, Ed. Kamran Talattof (London: Routledge, 2015): 365-394; Evyn Kropf, "Historical Repair, Recycling, and Recovering Phenomena in the Islamic Bindings of The University of Michigan Library: Exploring the Codicological Evidence," In Suave Mechanicals: Essays on the History of Bookbinding vol. I, Ed. Julia Miller (Ann Arbor, MI: The Legacy Press, 2013): 1-41.
origin: Refers to where, when, and by whom the manuscript was produced. In this scheme, the copyist, date of copying, place of copying, mode of copying, and destination (if copied for someone) are addressed to the extent possible, referencing where in the volume this information appears if explicitly stated. Date and place of composition are also relevant. ownership and history: Addresses marks and statements of ownership (including inventory marks, seal impressions, ownership statements, waqf statements, book prices, bookplates, etc. ), reading / study statements, book loan statements, transmission statements (ijāzāt, etc. ), and evidence of critical apparatus (including collation statements, description of the exemplar, collation marks, marginal corrections, glosses, reference marks, etc.) as well as notes and marks left by former owners (such as birth or death notices, magic squares, kabīkaj invocations, formulas, inventories, etc.). See Gregory Pass, Descriptive cataloging of ancient, medieval, Renaissance, and early modern manuscripts, Chicago: Association of College and Research Libraries, 2003.